A museum in the coastal town of Cuxhaven in northern Germany that is about shipwrecks and also more generally about Cuxhaven's maritime history as a major fishing port and base for maritime pilots. It has some stunning artefacts and installations. But it's all in German only. More background info: in a way this is actually a two-in-one site, as the current museum goes back to two different and separate museums: a) the old private “Wrackmuseum” ('shipwreck museum') that existed from 1980 to 2013, and b) the former “Fischereimuseum Cuxhaven” ('fishery museum'). Not all of the predecessors' contents have gone into today's museum, however. An important Titanic-related exhibit that my sister (who lives in this part of Germany) had told me she had seen in the old wreck museum was now no longer to be found in this new exhibition space. (It was a scale model demonstrating in an apparently very impressive way the sinking of the Titanic in all its stages, including the broken-in-two final wreckage.) A museum clerk who I enquired with about this reckoned that maybe the owner had just decided to keep this installation in his home rather than forfeit it to the new museum. On the other hand there have been new additions that neither museum had before, including some impressive audiovisual installations. Some parts were also moved here from the Stadtmuseum ('city museum') of Cuxhaven. 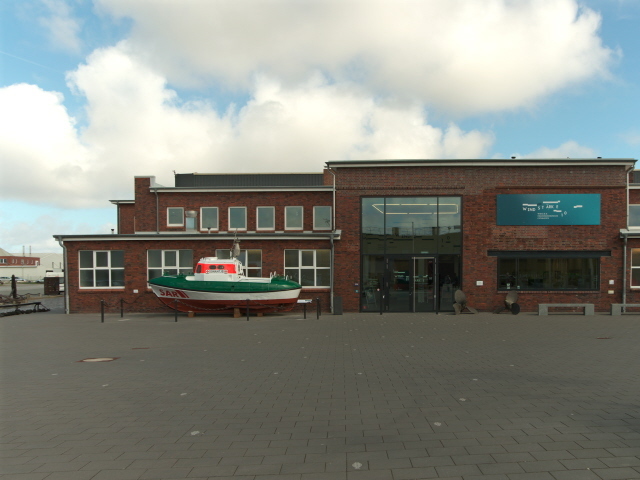 The new museum has the official name “Windstärke 10 – Wrack- und Fischereimuseum Cuxhaven”, which translates as 'gale force 10 – wreck and fishery museum Cuxhaven'. The building consists of two former fish packing halls in the harbour dating back to the 1930s. These have been connected with a new roof and glass walls at the end. This structure now forms the central hall between the two old buildings. The choice of location makes sense. Cuxhaven has long been one of the most significant fishing harbours in Germany (together with Bremerhaven). Although the industry has declined in recent decades, there is still a sizeable fleet of fishing boats based here and important fishing industry companies and canneries have their home here too. These days, the town is also an important centre for the wind energy industry. Cuxhaven is also a place where very early forms of tourism developed – going back some 200 years! It is still one of the most important “Kurorte” ('spa towns') namely as a “Seeheilbad” ('seaside health resort'). What there is to see: First things first: everything in this museum is in German only – all texts and all audiovisual installations, and there are no English-language guided tours or audio-guides either. That doesn't necessarily mean that there's no point coming here if you don't know any German. Many exhibits speak sufficiently for themselves and are still visually worth it, even if you won't get much out of the interpretative texts and labelling. But you'll certainly spend a lot less time here. Whether it's worth the time and effort (and the steep admission price) to come here specifically is debatable, but if you're in the region you should still consider it. If you do at least know a fair amount of German, it's a very interesting little museum and it has a few unusual and remarkable elements too. 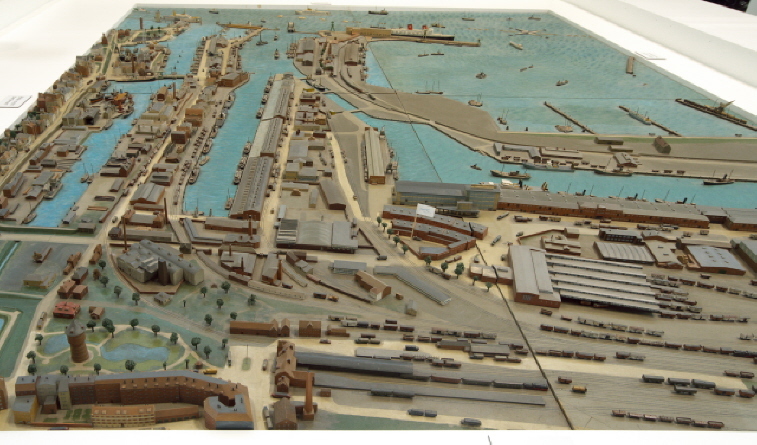 Once in the central hall, the permanent exhibition begins with a scale model of the historic harbour of Cuxhaven – with the location of the museum in it well marked. 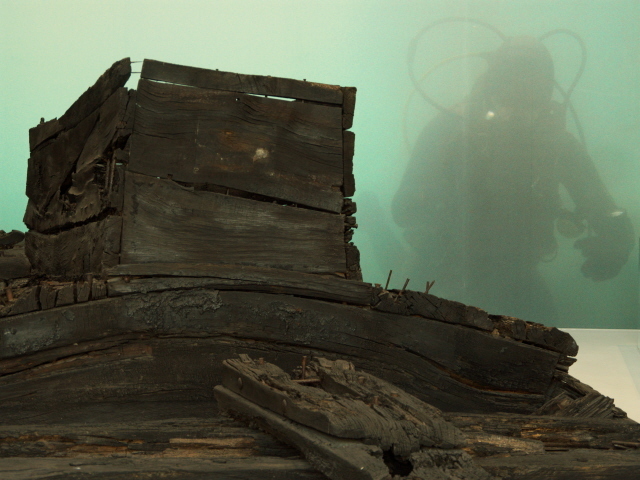 To the left of this is one of the museum's largest exhibits: a wreck of an old wooden fishing boat called “Wilhelmine”, accompanied by a few extra artefacts salvaged from her. She sank in 1928 and was discovered 1979. Opposite this is the space for temporary exhibitions (see below), to the right of this come the sections on Cuxhaven's fishery history. You can see lots of fishing nets, reconstructions of cabins aboard trawlers and parts of a bridge (helm included). Next to this is a section on fish auctioning and packing. Here the oddest but also most remarkable artefact is the former telephone exchange switchboard of the old Cuxhaven sea fish market auction hall. Back in the central hall this is complemented by a look at contemporary issues of fisheries – including the problem of over-fishing! The museum's main dark theme is approached next. Various types of distress at sea are illustrated and explained (not just storms, but also e.g. giant waves). 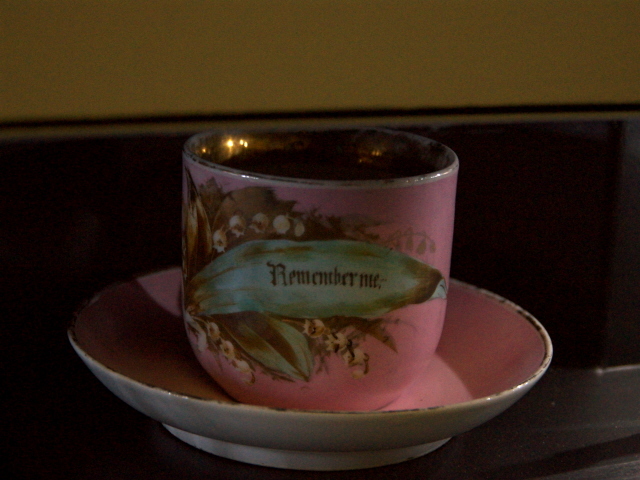 At one audiovisual station I listened to a gripping story of a survivor. Also covered in this section are the efforts of the lifeboat association of Germany (DGzRS – “Deutsche Gesellschaft zur Rettung Schiffbrüchiger”, roughly 'German Maritime Search and Rescue Service'). It has actually saved hundreds of lives each year! The role of Cuxhaven's harbour as a base for maritime pilots in the Elbe estuary and the German Bight is also part of this section, and you can see a reconstruction of the local pilot association's meeting room. Next to that section comes a semi-independent part, namely a room displaying a private collection of various antique maritime objects, many of them ship models, especially the type where the model is inside a bottle – what is known in northern Germany as a “Buddelschiff”. This includes what is allegedly the largest Buddelschiff in the world. There's also a small Titanic section in this part, again including a Buddelschiff: a lovingly made scene of the sinking of the iceberg stricken ship (though the icebergs are bit exaggerated perhaps). Next to it is an assortment of other Titanic exhibits, including a White Star Line sign in German. Another semi-independent part is on the other side of the central hall and is a collection belonging to the association that initiated this museum. In the central hall several items salvaged from shipwrecks and parts of wrecks themselves are already on display, but the main section that is actually about shipwrecks is a separate hall entitled “Unter Wasser” ('under water'). 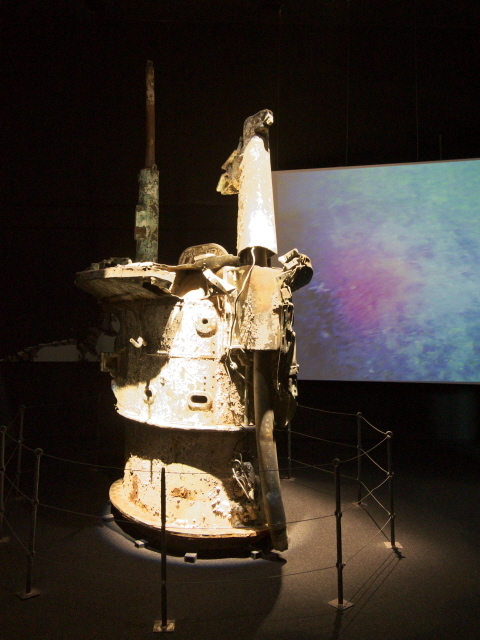 In this gloomy and darkened space you can see large bits of wrecks, such a conning tower of a British submarine from WW1 that sank near Heligoland in 1916. Another huge item is a propeller from the emigration ship “Cimbria” that sank in the German Bight in 1883, taking with it 437 of the 493 people on board. An especially harrowing story is that of the single survivor of the German cruiser “Cöln” that was sunk by British warships at the beginning of WW1 in August 1914. He drifted in the waters for two days and three nights before he spotted one of the cruiser's lifeboats with a few of his shipmates who pulled him into the boat. All the others died one after the other before the boat was finally found 76 hours after the sinking. The story is illustrated in a dramatic fashion in a 360-degree video projection that gives you at least a visual approximation of an impression of what it's like being lost at sea. 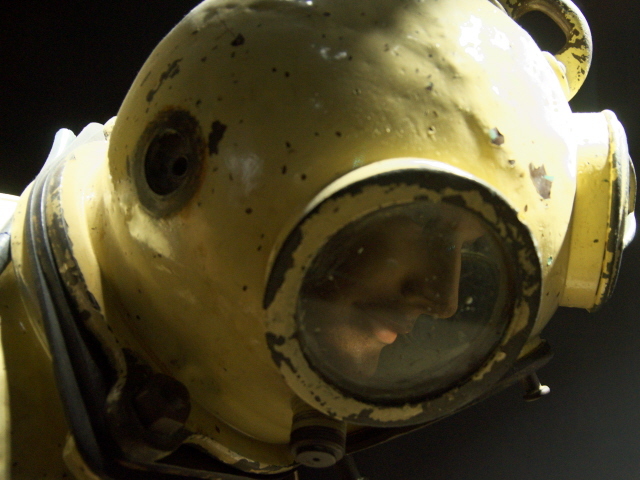 Also on display in this section are countless items salvaged from these and other shipwrecks, as well as diving equipment such as is employed in salvaging from wrecks or other underwater work in the Elbe estuary. That more or less finishes the museum's permanent exhibition, except for a kid's part that I (naturally) gave a miss. But there was also a temporary exhibition on at the time of my visit (April 2017) that was quite fascinating. It was on the topic of “Animals on board”. These included both cargo (e.g. to supply zoos) and pets kept by sailors … but also creatures that were rather unwelcome guests aboard ships, such as rats, cockroaches or wood-boring pests such as the teredo navalis shipworm. They even had a few live specimens of this creepy species on display in a tank! The museum shop is quite large and has numerous books, gifts, postcards and other maritime-themed items and souvenirs on offer. Back outside you can also take a look at the collection of open-air displays, mostly yet more parts from shipwrecks but also buoys and a modern lifeboat – or rather: a search and rescue (SAR) vessel that used to be operated by the DGzRS (see above). This was actually the museum's most recent acquisition when I visited the place in April 2017. It had literally just arrived. All in all this is quite a fascinating museum in some parts, though by no means in all of them (unless you are heavily into fishing and ship models), and tells some gripping and often tragic stories. However, you only get these if you know German. For international visitors without the prerequisite knowledge of this language, the museum will offer far, far less, perhaps too little to make it worthwhile going there, even though some of the exhibits work perfectly OK just for the visual impressions or are self-explanatory without text. Location: Cuxhaven lies at the mouth of the River Elbe, precisely at the point where the estuary ends and the North Sea begins. It is the northernmost town of Germany's second-northernmost federal state Lower Saxony, some 60 miles (100 km) north-west of Hamburg. The museum is directly adjacent to Cuxhaven's fishing harbour, which also isn't far from the town centre. The official address is Ohlroggestraße 1 (in 27472 Cuxhaven), even though that street doesn't exist as such any more – it was the road running between the two fish packing halls that have been connected for the construction of the museum. The former road was where there is now the museum's central hall. A sign at the location that would be the official address directs visitors to the actual entrance, which is round the corner at Reinekeweg. Access and costs: quite easy to get to both by car or public transport; a bit expensive. Details: The museum is right in the heart of the fishing harbour of Cuxhaven. But it's still only a short walk from the town's main train station – it's less than half a mile (600m). And from the adjacent bus terminal it's even shorter. You just have to walk round the big department store/supermarket along the street Am Bahnhof, cross Neufelder Straße and the entrance to the museum is just ahead. The proximity of the station makes it possible to come here even all the way from Hamburg, thanks to Cuxhaven's efficient rail connection to that city (hourly trains that take an hour and 44 minutes). If you're driving, then you're presumably coming from the south along one of the main routes leading to Cuxhaven, the B-73 trunk road and the A-27 motorway. At the roundabout at the intersection of the two just south of Cuxhaven take the exit for “Alte Liebe”/Innenstadt and drive along Papenstraße for ca. two miles (3 km) then turn right into Am Bahnhof and then left onto Neuenfelder Straße. There are a few parking spaces right by the museum. Alternatively there are more spaces behind the museum on Schröderstraße. Opening times: daily from 10 a.m. to 6 p.m. between April and October. In the winter season, November to March, open only to 5 p.m. and closed on Mondays. Also closed over Christmas and New Year's Eve/Day. Time required: If you can read German then something like an hour to an hour and a half. If you can't read German then you'll probably be done in as little as 15-20 minutes. Combinations with other dark destinations: The old “Hapag-Halle” at the harbour's “Kai der Tränen” ('quay of tears') has exhibitions about emigration to the Americas – a kind of local equivalent to the BallinStadt in Hamburg and the Deutsches Auswandererhaus in Bremerhaven. In contrast to those places, this terminal in Cuxhaven is still in use, though these days not for transatlantic liners but only for the occasional cruise ship. Also on the waterfront is a monument that commemorates the minesweepers of WW1 and WWII. It incorporates a (replica) sea mine itself. Cuxhaven is also the port from where regular boats depart to Heligoland year-round (the speedboats from Hamburg operate only in the summer season). So if you have time, that delightful and interesting island would make the perfect combination. And south-west from Cuxhaven the Bunker Valentin on the northern edge of the city of Bremen is a stunning Third-Reich-era site with a naval connection. If you have a car, you can also go to some interesting non-maritime dark sites inland in northern Lower Saxony, in particular the former POW camp Sandbostel, or, even further away, Bergen-Belsen. And of course Hamburg, thanks to the direct train connection, is also within fairly easy reach and offers a whole hosts of sites for dark tourism. For places further away see also under Germany in general. Combinations with non-dark destinations: Cuxhaven is actually a fairly touristy town – but mainly in the form of a seaside resort kind of place. It's not your usual splashing-in-the-sea-waves kind of beach paradise, however, because the beaches and marshes here border the “Wattenmeer”, an intertidal zone of coastal mudflats (literally translated as 'Wadden Sea' on Wikipedia, though I have to admit I'd never encountered that term before). The fun here is rather to go hiking on the mudflats (and get your feet really mucky in the process). At low tide you can walk as far as some outlying islands (well, only at high tide are these actually proper islands surrounded by water rather than mud), in particular Neuwerk with its massive red-brick lighthouse. The whole northern German and Dutch Wattenmeer is actually on the UNESCO World Heritage List and a nature reserve, so there are some access restrictions in place, e.g. regarding the island beyond Neuwerk, Scharhörn, which is a protected bird sanctuary that is out of bounds to the public except on special guided tours.